A small-time rancher agrees to hold a captured outlaw who's awaiting a train to go to court in Yuma. A remake of a 1957 classic, 2007’s 3:10 to Yuma introduces us to cattle rancher Dan Evans (Christian Bale). A family man, he struggles to keep his farm afloat. Ben Wade (Russell Crowe) and his gang rob a stagecoach and kill its inhabitants. Before long, authorities capture Wade but his subordinates flee. A group needs to take him to the town of Contention so Wade can be placed on the 3:10 prison train to Yuma. Given the danger that comes with this assignment, no one seems eager to accept, but eventually Evans agrees – for the price of $200. We follow attempts to get Wade to the train and the drama that comes along the way. I’ve often contended that remakes should focus on movies that weren’t very good. When we get a new version of a film that already succeeded, there’s nowhere to go but down – in theory, at least. Because I liked the 1957 Yuma so much, the 2007 version seemed like a case in which the remake wouldn’t be able to live up to its predecessor. Nonetheless, with a lot of talent involved, I hoped the 2007 edition would offer a film that could hold up well, even if it fell short of the original flick’s quality. And the 2007 Yuma does work nicely, though I don’t think it matches up with its predecessor. That one excelled on so many levels that it would be tough for a remake to compare. The 2007 Yuma opens up the story’s world a bit more, as it seems less claustrophobic than the 1957 edition. While I wouldn’t call it an epic, it seems to bring a broader focus than the intense tension between the two leads. That seems good and bad. On one hand, I miss the interpersonal dynamics of the 1957 film, as the battle of wills added a lot to the movie’s effectiveness. On the other hand, though, I’m glad the 2007 version didn’t simply offer a slavish recreation of the prior take. As I alluded, I’m not sure it’s a smart idea to remake good movies, but if this occurs, the new edition should offer clear changes, and the 2007 Yuma takes that path. This makes it more of an adventure than the psychological drama of 1957, though the 2007 Yuma still provides some good character moments. In particular, Crowe offers a fine performance, as he makes Wade an appealingly slippery personality. When it turns to action, Yuma does nicely. It brings some good scenes in that regard, and these contribute to the movie’s success. All of these areas combine to create a fairly enjoyable Western. While I don’t think the 2007 Yuma works as well as its predecessor, it still turns into an engaging, taut tale. 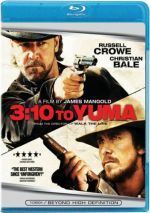 3:10 to Yuma appears in an aspect ratio of approximately 2.40:1 on this Blu-ray Disc. The film boasted fine visuals. Sharpness worked well. While the occasional wide shot betrayed a sliver of softness, the majority of material appeared accurate and concise. No issues with moiré effects or jaggies occurred, and I saw neither edge haloes nor source flaws. In this Western setting, the series favored a fairly amber/orange palette – though on the dusty side of things. 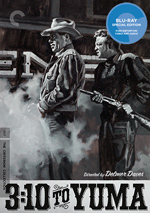 Within the stylistic constraints, the Blu-ray reproduced the colors in a favorable manner. Blacks came across as deep and dense, while shadows – important in such a dark series – appeared smooth and well-developed. The movie offered pleasing picture quality. Just as good, the movie’s Uncompressed PCM 7.1 audio also satisfied. Music showed nice stereo presence, while effects added immersive material. The action sequences boasted fine use of the side and rear speakers, all of which brought us into the story well. Audio quality seemed strong. Music was full and rich, while dialogue seemed natural and distinctive. Effects offered clear elements, with warm, tight lows. I liked the soundtrack for Yuma. Expect a broad array of extras here, and these start with an audio commentary from director James Mangold. He provides a running, screen-specific look at the original film and its adaptation, cast and performances, influences, story and characters, sets and locations, cinematography, editing, music and related areas. Mangold tends to provide good commentaries, and this one follows that trend. He covers a logical array of topics and does so in an informative, engaging manner during this worthwhile chat. Seven Deleted Scenes fill a total of seven minutes, 55 seconds. These mostly expand some secondary characters and add a little exposition. Though not bad, they don’t really add much. A mix of featurettes follow, and these launch with Destination: Yuma. It fills 20 minutes, 58 seconds with info from Mangold, producer Cathy Konrad, production designer Andrew Menzies, set decorator Jay R. Hart, writer Michael Brandt, director of photography Phedon Papamichel, key armorer Thell Reed, 2nd unit director/stunt coordinator Freddie Hice, special effects coordinator Ron Bolanowski, costume designer Arianne Phillips, and actors Christian Bale, Russell Crowe, Logan Lerman, Luce Rains, Kevin Durand, Gretchen Mol, Peter Fonda, Dallas Roberts and Ben Foster. “Destination” looks at the adaptation of the prior film, sets and locations, stunts and action, costumes and period details. “Destination” repeats some info from the commentary and can feel a bit fluffy, but it still delivers enough substance to be worth a look. During the 12-minute, 58-second Outlaws, Gangs and Posses, we hear from historians Dr. Roger McGrath, Will Bagley, Professor Richard W. Sadler, Ben Traywick and Don Taylor. As expected, “Gangs” looks at some of the history that informed the film’s fiction. It becomes an efficient little overview. Next comes An Epic Explored, a six-minute, 22-second reel with Mangold, Foster, Bale and film writer Stuart Beattie. “Epic” examines aspects of the Western genre, and it becomes a quick but insightful take on the topic. Music comes to the fore with 3:10 to Score. It spans seven minutes, 38 seconds and features Mangold and composer Marco Beltrami. We learn about aspects of the score and get a useful synopsis of those musical choices. After this we move to the 19-minute, 39-second From Sea to Shining Sea. It boasts remarks from Sadler, Bagley, McGrath, Golden Spike National Historic Site’s Martin Soholt and historian W. Paul Reed. “Sea” brings us information about the 19th century expansion of the railroad and its impact. Once again, this becomes an informative program. A Conversation with Elmore Leonard lasts five minutes, 24 seconds and offers the author’s thoughts on his original story He tells us a few nice notes about his work. Finally, The Guns of Yuma goes for six minutes, 17 seconds and includes Mangold, Bale, Durand, Fonda, Crowe, actor Alan Tudyk and key armorer Thell Reed. As expected, this show details the weapons used in the film. It winds up as another useful show. Two interactive programs ensue. A Historical Timeline of the West allows the viewer to trace aspects of 19th century history and see text details. It contributes solid background. We also find Inside Yuma, a feature that runs alongside the movie. It offers two options: to see the film’s storyboards or its script. Either one takes up a lot of real estate on the screen, which makes it more difficult to watch the movie as it progresses. Still, I like the ambition of “Inside”, as it can be fun to compare the boards and the script to the final product. The disc opens with ads for Rambo, War, Lord of War, The Condemned, Crank, Good Luck Chuck and The Punisher. We also get a trailer for Yuma. 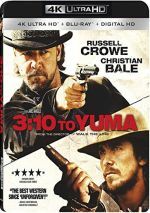 Perhaps not as effective as the 1957 version of the tale, 2007’s 3:10 to Yuma still offers an effective Western. It offers its own approach to the subject and creates an involving drama. The Blu-ray delivers very good picture and audio along with a useful roster of supplements. Yuma fares nicely.